The oxeye daisy is a delicate wildflower that measures approximately 30-90 cm. in height. Composite flower heads are positioned singularly atop the terminal shoot and look typically daisy-like, having a yellow central disk surrounded by white petal-like rays. This wildflower has two types of leaves: short leaves that are positioned along the length of the stem and long basal leaves. The basal leaves are dark green and pinnately lobed or coarsely toothed. The composite flowers of the oxeye daisy are comprised of a yellow, depressed central disk of female and male rayless flowers surrounded by female flowers having short, petal-like, white rays. These rays are large and densely overlapped. This wildflower has two different types of leaves. The dark green, coarsely-toothed or pinnately-lobed basal leaves are long, measuring approximately 15 cm. in length . The leaves along the stem are considerably smaller measuring approximately 7.5 cm. in length.. 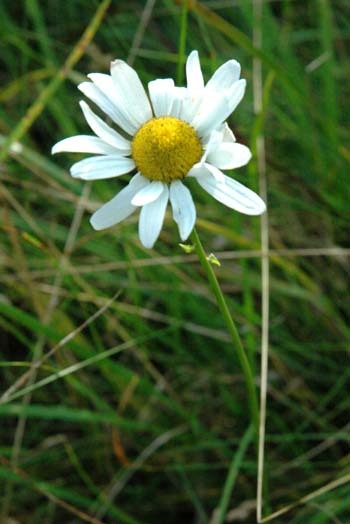 The oxeye daisy grows best in meadows and pastures, along roadsides, and around waste areas. Oxeye daisy is a fast growing weed that has become a nuisance for dairy farmers. When consumed by cows, the oxeye daisy gives an unpleasant flavor to the milk.